Remote Control : Both a button-activated (up to 30m) and keyless (up to 3 m) automatic remote control options are available. Once the keyless remote control module is mounted either on the key holder or the vehicle itself, the vehicle recognition feature enables hands-free access permission within 3 meter proximity of the blocker system. 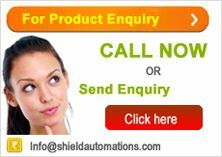 Up to 500 button-activated or keyless automatic remote control modules can be introduced to the blocker recognition system. Button Control : Road Blocker operates with either single or double button control. In single button contron unit, blocker performs the next task in each button push (i.e. if barrier is on, with the push of the button it will be off). In double button control unit, seperate on and off buttons are available for each task. 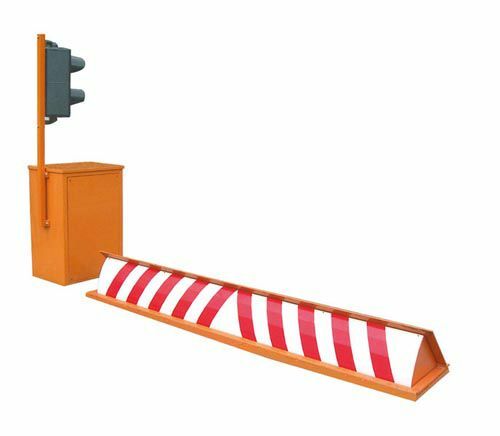 Time Control : If automatic activation of entrance blockage is desired in a specific time interval following the access permision, a time interval adjusting unit is available for the Road Blocker system. Access Control : For access triggering; dry-contact, 3-50 V DC boost, TTL, CMOS or direct PC controlled RS 232-RS485 can be used. Sensor Control : In case a vehicle stalls on the Road Blocker, or even if for some reason the control unit triggers access blockage, safety sensor prevents upward motion of the blocker. Once the vehicle completes entry, system resumes its upward motion pending in its memory, System is also equipped with additional safety sensors for trucks. System : Electronic circuitry features microprocessor controlled design. Mechanical thrust is provided by hydraulic pressure. Corrosion resistanst steel is used in Road Blocker manufacturing. Electronic control circutry continuously monitors hydraulic pressure and current position of the blocker. If a vehicle is detected on the blocker, safety sensors intervene and prevent upward motion of the blocker. Warning Light : During upward or downward motion of the blocker, flashing warning lights mounted on top of the device are turned on until the motion of the blocker is fully completed. option of Red/Green traffic light warning system is also available. Emergency Mode : Control option is available via connection to security systems. In case of energency situations such as fire alerts, unrestricted access mode is automatically activaded. Extras : Variety of power feed options can be provided according to customer demand. Optimum solutions to customer needs can also be devised. Quality Standards : Fast and uninterrupted high-quality, expert technical support throughout Turkey, Turkish Republic of Northern Cyprus, Central Asia and the Balkans.